Whether one calls March 17th “St. Patrick’s Day” or “Evacuation Day,” the Irish can lay claim to both celebrations. Many men bearing surnames of “the old sod” were nestled behind bristling cannons that peered down from Dorchester Heights on that day in 1776. The redcoats, or “Lobsterbacks,” were fleeing Boston aboard Royal Navy vessels straining to haul anchor and hightail it out of the harbor – which lay directly under the Rebels’ heavy guns. Commanding the Patriots was George Washington, who held a deep regard for Irish-born troops serving in his ranks. He placed such a high estimate upon their proven combat abilities that he honored that most cherished of Irish dates – St. Patrick’s Day – in an era when the Irish, especially Irish Catholics, were hardly a favorite of many colonists. Washington also proffered another tip of his tri-cornered hat to Patriots with Irish surnames as the British troops boarded their transports. On that momentous day, he had General John Sullivan countersign the dispatch making “Saint Patrick” the army’s official watchword. The son of an Irish schoolmaster who had emigrated from Kerry or Limerick to Berwick, Maine, in 1723, Sullivan was one of many Rebels who either hailed from Ireland itself or were the sons of native-born Irish. 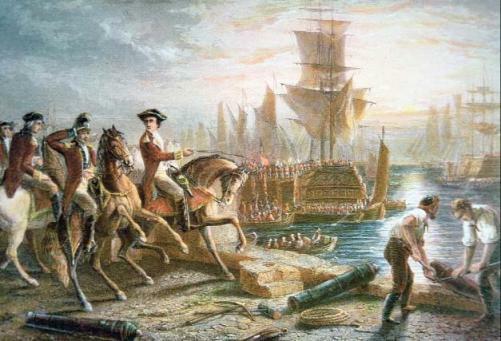 In 1776, as one of Washington’s most trusted officers, Sullivan had long recognized the Rebels’ need for heavy artillery to enforce the siege of Boston. Washington had received, on Dec. 17, 1775, a letter from Colonel Henry Knox, a man of Irish lineage noting that the heavy artillery so sorely needed by Washington was available at Fort Ticonderoga in upstate New York, a British fortress that had been captured by Rebel Ethan Allen and his Vermont Green Mountain Boys. Knox, who had been sent to New York on a mission, wrote: “I hope in sixteen or seventeen days to present to your Excellency a noble train of artillery, the inventory of which I have enclosed. According to the historian James Bernard Cullen, “Colonel Knox kept his word. With an enterprise and perseverance that elicited the warmest commendations, he brought, over frozen lakes and almost impassable snows, more than 50 cannons, mortars, and howitzers. With this train in place, Washington strengthened his position and planned make a more decisive move against the enemy. Cullen notes: “Moylan Street at the Highlands obscurely keeps his memory among us.” Throughout the Revolution, Moylan proved one of the Continental Army’s most daring and resourceful officers, as well as a personal favorite of Washington. While Irishmen eagerly joined the Rebels’ cause out of a desire both for independence and a chance to settle historical scores with the British, the Crown encountered pronounced difficulty in recruiting the Irish in Ireland and in the Thirteen Colonies to don the scarlet tunic of the British army and march into battle beneath the Union Jack against Washington’s troops. For the army’s “sign” and “countersign” on St. Patrick’s Day of 1780, Washington chose the passwords “Patrick” and “Shelah” (a scholar notes that the latter term referred to “one of the historic personifications of Ireland”). One look at the muster rolls of the Continental Army proves the Irish presence on March 17 at Dorchester Heights and throughout the Revolutionary War. They witnessed what their countrymen on the “old sod” could only dream of: the British in full flight. Today, 241 years later in Boston, March 17 fittingly marks both St. Patrick’s Day and Evacuation Day – the celebration alike of Ireland’s venerated saint and the day the Redcoats departed Boston for good.